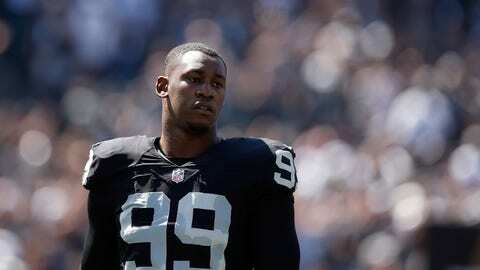 Oakland Raiders defensive end Aldon Smith is under investigation after a domestic violence complaint was filed with the San Francisco police on Saturday, San Francisco Police Department spokeswoman Giselle Talkoff told USA Today. Smith has not been arrested and no charges have been filed. Both he and the woman who filed the complaint are reportedly cooperating with the investigation. The 27-year-old defensive end is suspended from the NFL after repeatedly violating the league's substance abuse policy. He applied for reinstatement, but in December the league deferred making a decision on his appeal until March, leaving him sidelined for the remainder of the 2016 season. He last played in 2015 season when he had 28 tackles and 3.5 sacks in nine games for the Raiders. He last played a full season in 2012 for the 49ers, and was selected to the Pro Bowl after making 66 tackles with 19.5 sacks in 16 games.